Cregagh Green is where Best, renowned as one of the greatest ever footballers, first flashed his meteoric talent as a schoolboy in the 1950s. It is situated in the east Belfast housing estate where he grew up. It is the first pitch in Northern Ireland to twin with Flanders Peace Field, site of the 1914, First World War, Christmas Truces. Cregagh Community Association with the support of Belfast City Council recognised the value of The Peace Fields Project, commemorating the First World War and celebrating peace. The NCFA highlighted the connection of one of Northern Ireland’s greatest ever sportsmen that brought communities together with men and women, from the same communities that fought side by side in the First World War. The Cregagh Green open space is protected “in perpetuity” through a legal deed of dedication between Belfast City Council and the Fields in Trust organisation. Best’s legacy is truly celebrated in his home country. His legacy still brings communities together – the connection with the humanitarian at the Christmas Truces witnessed German and Allied soldiers come together, to play the game that inspired a legend. Best was voted European Footballer of the Year in 1968 as he helped Man Utd win the European Cup, scoring twice in the 5-1 win of Benefica. 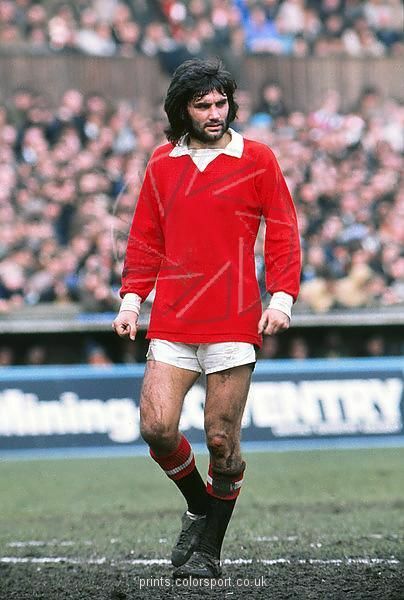 United’s George Best at Highfield Road. He was nicknamed El Beatle afterwards, at the height of Beatlemania. Brazilian star Pele also reputedly described him as the greatest footballer in the world. George Best became one of the greatest football icons of his day celebrated by all members of the community. His talent and determination spoke to a generation of young people that identified with his passion for the beautiful game. George was the poster that boys and girls had on their bedroom wall. He was simply a cut above the rest. George Best brought communities together and football was his domain for creative expression. Robin McCabe, a childhood friend of Best, remembers playing against him on Cregagh Green. “All we did was play football from morning to night,” he told BBC Radio Ulster. “There was 10-a-side, 12-a-side, 15-a-side, everybody played, we were lucky we had a ball sometimes. “Everybody played together – North Bank, which was the part George lived in, I lived at South Bank. “We played challenge matches between North Bank and South Bank, maybe 20-a-side after teatime at night, you know, it just went on and on. “We always thought that he needed a ball for himself and the rest of us needed a ball. Football is the peoples game. History is peppered with the power of football. The Peace Fields Project is a cross curricular peace education programme. It contextualizes history and inspires young people to become peace makers for the future. Cregagh Green to be twinned with Flanders Peace Field Young people from east Belfast are at the heart of a unique Peace Field Project (PFP) to commemorate the centenary of the First World War. Designated a Field in Trust, Cregagh Green was also where the legendary George Best first kicked a ball, and during his football career united communities across the city. And as part of the official twinning ceremony on Wednesday 18 April, pupils from three local primary schools will take part in a ‘friendly’ in memory of WW1. Alderman Tommy Sandford, chair of Belfast City Council’s City Growth and Regeneration Committee, who is attending tomorrow’s ceremony, said: “This is a very poignant way for the next generation to mark the centenary of the end of WW1; to reflect and learn about some of its history. A presentation by the NCFA is taking place this evening (Tuesday) at Cregagh Community Centre. National Children’s Football Association (NCFA) is a coalition of agencies and organisations that safeguard and advance the rights of children in football. The NCFA also acts as a focal point and network for individuals and organisations seeking sustainable partnerships, information, education and/or training on child-centred approaches and children’s rights in football. The Peace Fields Project (PFP) is an extension of the Heritage Lottery funded 2014 Football and Peace Project, inspired by the Christmas truces of 1914. It considered how a symbolic moment of WW1 history relates to the present day mission of the NCFA. PFP linked the escapism of play with the historic and explored conflict resolution. It provided young people with the opportunity to research their heritage in the First World War through the medium of sport. All participants pledged to twin their designated areas of play with Flanders Peace Field, Messines, Belgium. This incredible WWI story of Catholic and Protestant from same street is one of many true-life stories that inspired The NCFA to approach Cregagh Community Association and Belfast City Council to consider a Peace Pitch. Twinning a designated area of play with Flanders Peace Field, site of the 1914 First World War Christmas Truces. Medal in the Drawer shines a light on the fact that, in the midst of the Home Rule crisis, a time of great unrest between nationalists and unionists in Ireland, William Kerr, a west Belfast Catholic, chose to join Carson’s predominantly Unionist 36th Ulster Division, rather of one of the Irish regiments. The young man enlisted almost immediately after the outbreak of war in 1914, along with Tom Martin, a Protestant who lived two doors away at Forthriver Gardens off the Springfield Road. The pair joined the 14th (Young Citizen Volunteer) Battalion of the Royal Irish Rifles and were shipped off to the Western Front, from where neither would ever return. Tom perished in a trench collapse in the lead up to the Somme, while William was killed in 1917 at Langemarck during the Third Battle of Ypres. The play also features two entirely fictional characters, who are based upon the experiences of real people. When she took on the daunting task of writing Medal in the Drawer, Brenda conceded that she knew comparatively little about the First World War. However, she did know about her ‘Uncle Willie’, and was keen to know more.